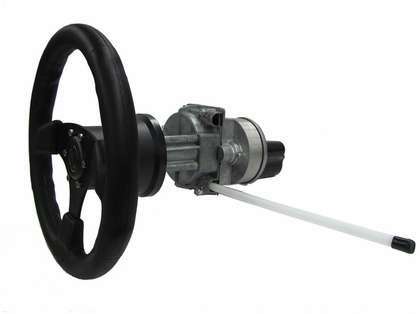 The Straight shaft drive unit replaces the manual drive used on cable steered boats and is mounted directly behind the dash. The drive is directly compatible with the Morse 290 steering helm but comes with its own bezel kit and can be retrofitted in most installations using the cable and steering wheel from the manual steering helm on the boat. This drive can be mounted in 2 ways, either at 90 Degrees to the dashboard or at 20 Degrees to the dashboard. Spacer Kits are also available to reduce the space required behind the dashboard.